Penne al forno is a classic Italian baked pasta dish and one of the world's greatest comfort foods. It is a winner with children too. 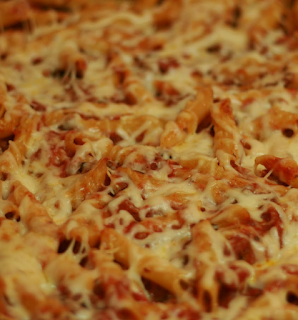 Americans call it 'baked ziti' and use canned tuna or ground beef in the sauce. My recipe is cheap simple and tasty, using smoked bacon and cheddar cheese sauce. Pasta: Boil the pasta in plenty of salted water and a drizzle of olive oil until it is slightly soft and nutty in texture. Do not overcook it at this stage because the cooking process is finished in the oven as it bakes. Drain the pasta and set aside. Sauce: Using the same pan wiped dry, add 3 tablespoons of olive oil to heat until the oil is very hot. Add the finely diced bacon and fry until crispy. Add the onion and stir-fry with the bacon until it begins to soften. Add the garlic and stir for a few seconds to combine it. Add the passata and chopped tomatoes and bring to the boil, then reduce to a fast simmer. Add the dried herbs and sugar. Season with milled black pepper and simmer for 20 minutes, adding more water if the sauce begins to dry up. Taste and adjust seasoning where necessary. Remove the pan from the heat and add the cooked pasta to the pan. Stir to mix then transfer the mixture to a baking pan or oven-proof gratin dish, leaving enough room on top to accommodate the cheese sauce. Cheese sauce: In a small saucepan, heat the remaining olive oil and add the flour. Stir to mix until all the flour is oily. Add milk and stir until the sauce thickens. Keep stirring and add more milk until you have a thick roux sauce. Add 2/3 of the grated cheese and stir to make a rich cheese sauce. Now layer the sauce over the pasta mixture. Sprinkle the remaining cheese over the sauce and season with more milled black pepper. Bake at 200 C (350 F) for 30 minutes until the cheese sauce starts to brown and bubble. Remove from the oven and allow it to stand for 10-15 minutes before serving. Garnish with fresh basil leaves. Serve generous portions on a plain white pasta plate with crusty Italian bread and a green salad on the side. Have plenty of Chianti Classico and/or Peroni beer to hand. Take your time and enjoy the food and the company - Italian style! Dedicated to my dear friends and colleagues at Circle Housing Group.